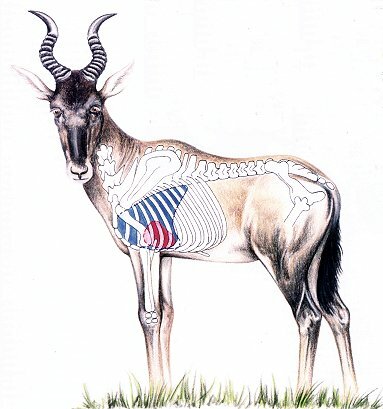 The illustration below of a Red Hartebeest, with anatomy similar to that of a Blesbuck, shows that a centre body shot behind the shoulder usually results in a running animal. The safe body shot on species with this anatomy structure is below the horizontal centreline and on the shoulder, if the shot is taken broadside. I prefer quartering shots as it is then possible to place the bullet path through the vitals while not hitting either shoulder. The illustration below is from an excellent article by Pieter Stofberg in Vol. 7 No. 5 of African Hunter Magazine.